The mechanics of brain washing started with one of the greatest scientific discoveries of behavior. It was the experiments that are dubbed classic conditioning conducted by the Russian Scientist Ivan Pavlov ( classic conditioning) . 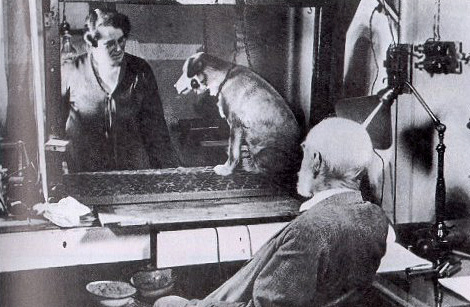 Unbeknownst to Pavlov he recorded the techniques used in any basic brain washing programs even though his subjects were animals. All the conditions that are used in an organized program were present. John B Watson took the principles of classic condition and applied them to his experiment on humans. Watson’s experiments is the only one of its kind that was ever done on human infants that proved that human behavior is a matter of the type of conditioning they experienced. 1) Making the subject stand at attention or sit with legs outstretched in complete silence from 4:30 a.m. to 11:00 p.m. and constantly waking him during the few hours allowed for sleep. 2) Keeping the subjects in solitary confinement in boxes about five by three by two feet. 3) Withholding liquids for days to help “self-reflection”. 4) Binding the subject with a rope passed over a beam, one end fixed as a hangman’s noose round his neck and the other end tied to his ankles. He was then told that if he slipped or bent his knees he would be committing suicide. 5) Forcing the subject to kneel on jagged rocks and hold a large rock over his head with arms extended. It took a man who had undergone these treatments for days a while to recover the ability to walk. 6) At one camp North Korean jailers pushed a pencil like piece of wood or metal through a hole in the cell door and made the subject hold the inner end in his teeth. Without warning a sentry would knock the outer end side-wise, breaking the man’s teeth or splitting the sides of his mouth. Sometimes the rod was rammed inward against the back of the mouth or down the throat. 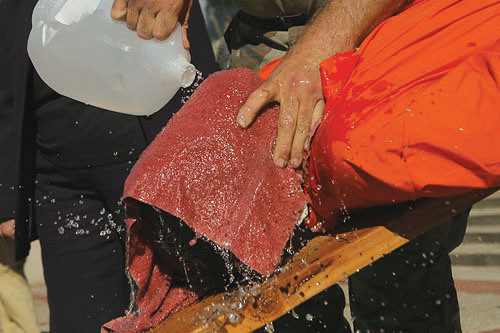 These are examples techniques used in “coercion interrogation” which is just torture, and when it comes to torture of human beings, our fellow human being can be very creative. 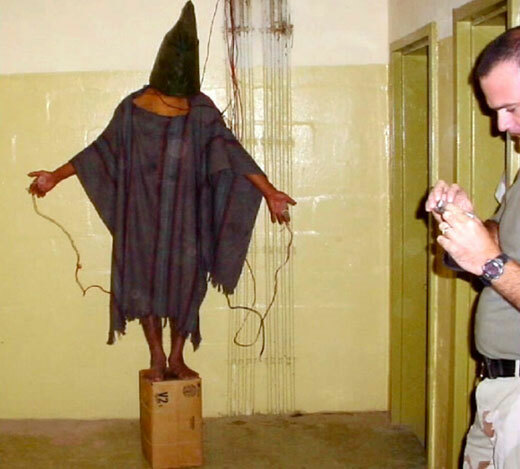 As you look at the above techniques, it is a parallel of what took place in the infamous Abu Ghraib prison in Iraq, and at the prison camp in Guantanamo Bay, Cuba. There is no way that those low level enlisted Military Police (MP) took it on themselves to torture the imprisoned insurgents. The MP command had to have knowledge as to what was going on. It was no secret that the method of interrogation used was coercion, and all members the correctional unit had to play a part. Recognize that the coercion does not start and end when the interrogator enters and leaves the room, it is an ongoing systematic process. An example of coercion application, which is a form of brainwashing, is a direct assault on the culture or religion of the subject. This type of coercion is used to “break” the subject, with the hopes of the subject giving information on their operations, or it could be used to alter behavior, and implant suggestions, etc. Lets look at some applications that had recently had come to light at the detention camp in Guantanamo Bay, Cuba. First let’s look at the meaning of the word, “cult.” The word cult was first derived during the Roman period; it has retained its meaning since those days. 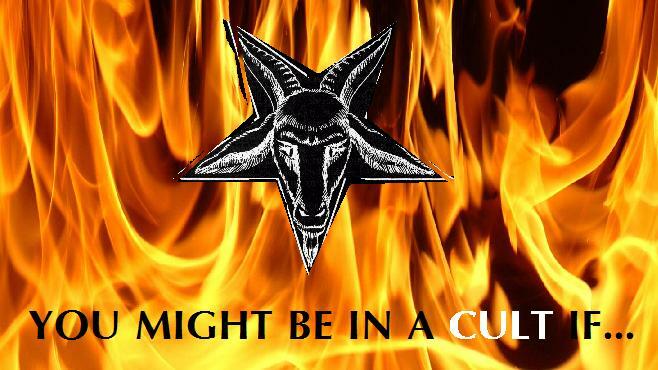 The word “cult,” refers to an organization with rites and rituals, also the formal means of expressing religious reverence, religious ceremony and rituals which means that virtually all-religious organizations fall into the category. It also means all the main stream religious organizations, Catholic, Islam, Judaism, Baptism, etc, as well as those other organizations, Universal Church, Nation of Islam, Christian Science, etc, all of them have some type of ceremony, and tradition. In addition it has the modern day meaning, which is a religion, or religious sect that is extreme, and has extreme views, and living in an unconventional manner under the guidance of a charismatic leader. An example of these types of groups would be those Muslim fundamentalist, like the Taliban under Mohammad Omar, Orthodox Jews under the Grand Rebbe Menachem M Schneersohn , the Universal Church under Rev. Moon, Nation of Islam under Louis Farrakhan, Catholic church under the Pope, etc. 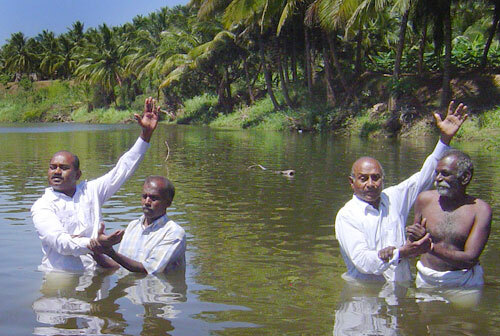 OK, let’s get back to the process that is used by these religions to brainwash their followers. Apparently in the United States a technique that was developed during the eighteenth century by Jonathan Edwards who had accidentally discovered it during a religious crusade in 1735 in Northampton Massachusetts, we call the technique “Conversion”. He found that by inducing, guilt and acute apprehension, and increasing tensions to the people that attended his revival meetings, they would breakdown and completely submit. Four years later it was used by another Christian revivalist, and as of today those techniques are still being used by the revivalists, even though most of them will not recognize or realize, that the techniques that they are using are brainwashing techniques it has been copied by others over the years. 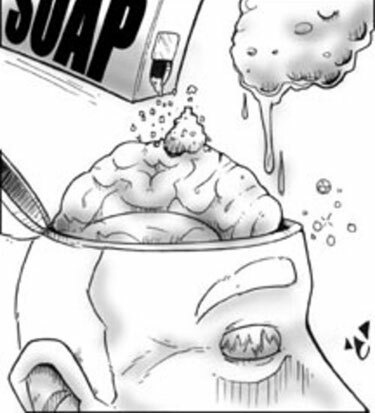 Technically what it does is wipe the brain slate clean so that the mind accepts new programming. An example of the application is as follows: Repetitive music is being played while the people are coming into the service. Typically the repetitive music has a beat in the range of 45 to 72 beats per minute. This is close to the human heartbeat, and it is very hypnotic and could generate an eyes open alerted state of consciences, putting the people into the alpha state and making them highly suggestible. You will see that that they exhibit external signs of trance-body relaxation, their eyes are slightly dilated and they often begin to sway, then the pastor, or assistant pastor will come out and speak using the voice roll technique. The “voice roll,” is a patterned paced style used by hypnotists. It sounds as though the words are being spoken in a monotonous pattern style. The words are delivered at a rate of 45 to 60 beats per minute for a full hypnotic effect. First he begins with the buildup process that induces the altered state of consciousness. Next a group of young people, usually females dressed in pure colored clothing will come out and sing. 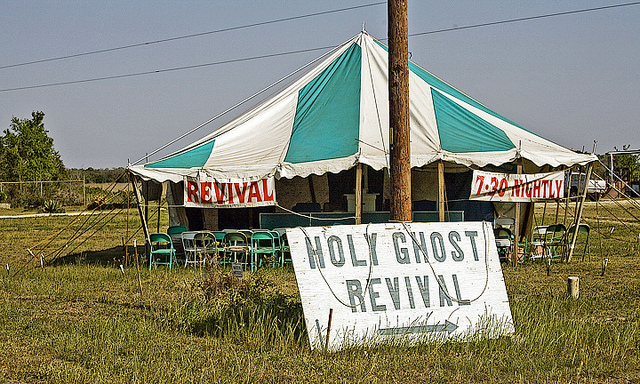 The Gospel songs are used to build up excitement and involvement. Perhaps one of the singers will be “smitten by the spirit.” That really generates increasing intensity in the room. At that point hypnosis and conversion tactics are being mixed. Now, this makes the audience’s attention span totally focused upon communication while the atmosphere becomes more exciting and intense. When the mass induced alpha state is achieved, that is usually when the plate is being passed around, to the background voice-rolling pastor exhorting, “give to god, give to god… Afterwards the brimstone and fire sermon will take place, this induces fear, and increases tension, because of all that talk of the devil, going to hell or Armageddon. After the fear induced sermon, “testifying, or “witnessing usually follows. People may come up and relate their stories, “I was a cripple, and now I can walk,” I was blind, now I can see,” this type of psychological manipulation works, after listening to the numerous cases of the miracle healings, the average Joe with minor problems thinks he too can be healed. In all the room is charged with, fear, guilt, intense excitement and expectations. Those who are seeking healing may line up around the stage; the pastor may touch them on the forehead, and scream, “be healed.” Typically the receiver will cry and fall down on the floor with spasms. What actually happened is that the individual is experiencing “Catharsis,” a purging of repressed emotions, again while this is taking place the brain-slate is temporarily wiped clean and the new suggestion is accepted. The staging and techniques varies from church to church. Also if the church is using a powerful sound system and the proper use of lighting they are a key factor in inducing an alerted state of conscience. Let’s look at a technique that cults as well as other organizations use to get new converts during a short space of time, perhaps a weekend. First the meeting or training must take place in an area where the subjects are cut off from the rest of the world. It could be any place, a private home, a remote or rural area, or a hotel ballroom. The subjects are allowed limited bathroom usage. If the organization is not religious, there is talk about keeping agreements in life. The subjects will then vow to themselves to their trainer that they will keep agreements. 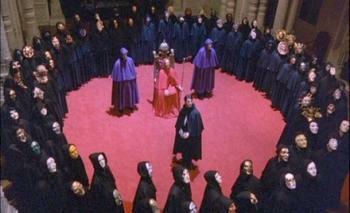 If anybody out of the group who does not make the vow will be intimidated into doing so, or forced to leave. They would also agree to finish the training, and may agree not to drink or smoke, and sometimes not to eat, or are given short meal breaks that anxiety, which could cause a slight malfunction of the nervous system making the conversion process more powerful. Secondly a schedule is maintained that causes physical and mental fatigue. Having the subjects take long hours of instruction, and giving them no opportunity for relaxation or reflections. Third, techniques are used to increase the tension in the room. Fourth, uncertainty, usually the subjects fear being put on the spot by the trainers, or forced to take part in some activity. If they are put on the spot, or forced to do something they don’t want to do, it literally puts them into an alpha state, which makes them become highly suggestible. Fifth, group jargon, which has meaning to none but the insiders, or various languages, is used for the sole purpose of making the subjects uncomfortable. Finally, there is no humor during the process, not until the subjects are converted; afterwards the humor that is talked about would be of their newfound joy to being converted. 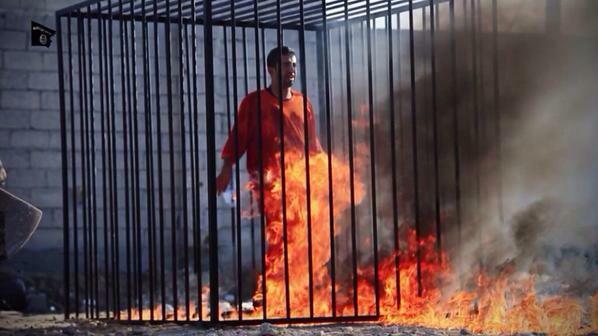 yes man do the most evil deeds to their fellow man…..